Packed with high-value interactive features for Residents, its bound to be a success for you. 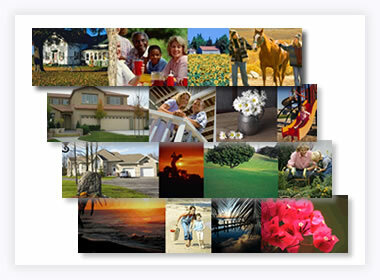 Every Neighborhood website s built using the very latest in collaborative intranet website technologies. All areas of the website can be configured and changed to meet your needs - all through our easy to use Staff administration area. A typical neighborhood website home page. Nearly all aspects of this home page can be changed! At the foot of the page you can see logos of additional 'sponsors' that have been placed there by the site owner. Members and Staff can quickly log in from this page. The menu, content, sponsors, headers and colors are all easily changed in the Staff administration area. 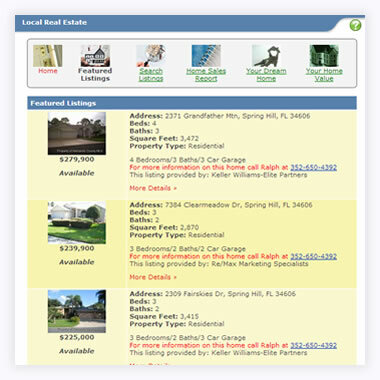 A comprehensive Real Estate Module allows you to upload and showcase your local listings, provide a sales history report to the neighborhood and also to link to your preferred Home Search Service (e.g. your IDX service) as well as various external news services! The Real Estate module has CMA and home buyers "Dream Home" forms that allow you to capture and respond to the interest of local residents. 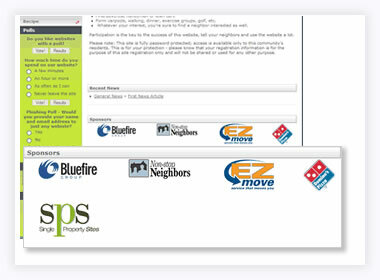 Staff can quickly create advertisers and show their logos in key spots on the websites. Adverts can be shown indefinitely or you may specify a time frame as agreed with your advertiser! Selling advertising can provide a valuable source of income which can easily offset costs! Get a Return on Your Investment ! The Automatic Digest solves one of the biggest challenges of any neighborhood website, which is how to make the use of the site more habitual. This fully automated email Digest updates members of your site on all recent additions and activities. Members click on the links to see the details and return to the site and participate. 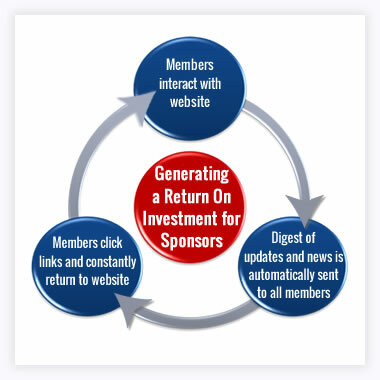 The automated Digest constantly drives members back so that you get a return on your investment! Websites come with a variety of color schemes all easy changed from the control panel. The NEWS menu item can be set up anyway you like! 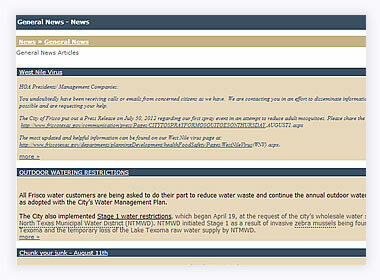 Add your own categorized news articles, or just make this a link to open up a local news source! 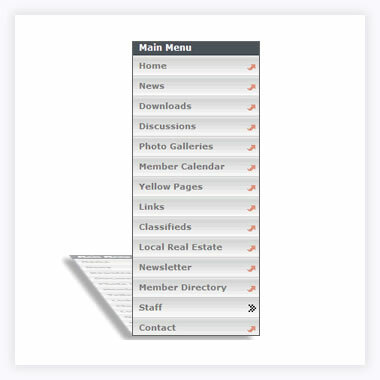 The website menu is simple to configure if needed, and can be easily changed by Staff (the administrator). The menu can grow to include links to internal pages and applications as well as links to any other web page. If needed, the menu can also support another level of pop-out sub-menus that add more flexibility to your menu design. It is possible to create specific menus that are shown for the general public, or shown just for logged-in Members. 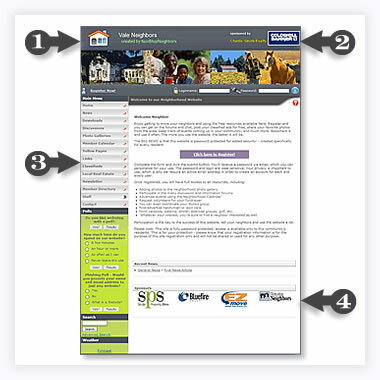 Staff can quickly set up any number of Polls and Surveys to take the pulse of the local neighborhood! 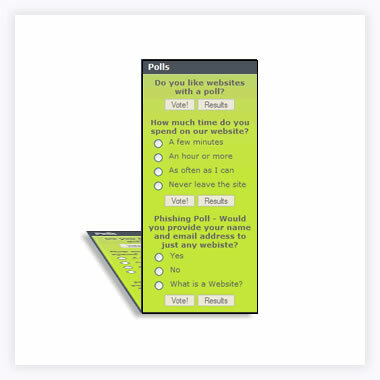 At any time, you may have multiple POLLS running! Polls can ONLY be voted on by the members! Every members vote is counted audited which makes the POLLS a great tool for making decisions as well. See the Business Benefits to you!